An international effort to end the brutal slaughter of dolphins in Peru has been initiated by BlueVoice.org and Peruvian-based Mundo Azul. The campaign is aimed at fishing practices that rely on killing dolphins to use as shark bait. Video of the slaughter of dolphins and the catch of undersized sharks off the coast of Peru was obtained in a daring undercover operation by Mundo Azul’s Stefan Austermuhle Based on calculations of the number of fishing boats and undercover testimony documenting the numbers of dolphins taken it is estimated that between five and fifteen thousand dolphins are killed yearly. 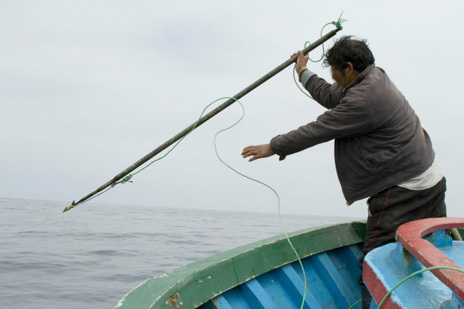 BlueVoice and Mundo Azul have called on the Peruvian government to both enforce existing laws and enact legislation banning harpoons on fishing boats. "Harpoons are used solely to kill dolphins and banning them would save the lives of thousands of dolphins, " said Stefan Austermuhle. "It is illegal to kill dolphins under Peruvian law but there is no enforcement so fishermen kill dolphins with impunity, " Austermuhle noted. 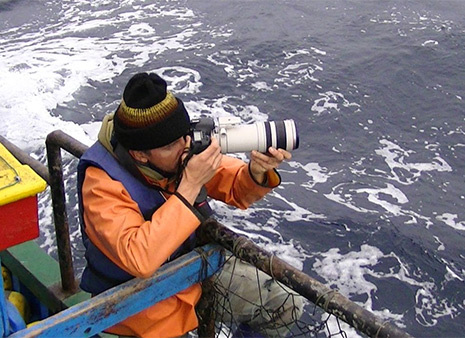 Austermuhl spent 24 days aboard a small Peruvian fishing boat to obtain footage of the harpooning of dolphins that were then cut into small pieces used to bait sharks. Footage from his expedition will be cut into a documentary film analogous to The Academy Award winning film The Cove. "It is my hope that our film will have a happy ending in which Peru rededicates itself to the protection of dolphins and its marine resources," said Executive Producer Hardy Jones of BlueVoice who has produced more than 70 documentaries for television. BlueVoice and Mundo Azul have conducted undercover surveys of the sale of dolphin meat and found several locations where illegal sales were taking place. There will be continuous surveys of fish markets over the coming months and a network of concerned citizens has been formed to report violations of dolphin protection laws to Mundo Azul's office in Lima. In addition to footage of dolphins being harpooned, our team has come back with shocking footage of shark finning in Peru. Sharks – most of them undersized – are brought to shore and finned. And we shot heart-wrenching footage of baby sharks being marketed for ceviche. Peru is well on its way to wiping out the shark populations along its coast. The government is doing NOTHING to stop it. We believe our efforts can change that. In addition to the film effort we are conducting a campaign in Peru to get restaurants to pledge not to serve shark or dolphin meat and to distribute information about the unlawful dolphin slaughter. Initial efforts have been highly successful. Many chefs in Lima as well as coastal tourist destinations have signed on.